Regulation of the railway means, for the most part, that access to services in the rail market is monitored. It checks whether the users of the railway network (the railway undertakings) are treated in a non-discriminatory and just manner. Regulation in its current form is a consequence of the evolution of the railway system from a structure based on national monopolies (the historic SNCB) to an integrated system whereby the network is opened up to different train operators that compete with each other (competition on the market). Since January 1st, 2007, the market for freight transport has been completely liberalised. On January 1st, 2010, the market for international passenger transport has also been opened up to competition. Since January 1st, 2019, the market for passenger transport has been completely liberalised. Regulation has evolved in recent years from more general powers to more specific missions, such as the monitoring of rail related services, supervision of the allocation of a public service contract, follow-up of the maintenance planning of the railway infrastructure, etc. These new powers are in line with the future liberalisation of domestic passenger transport. The opening of the domestic passenger transport market (for train services starting from December 12, 2020) makes it possible for each railway undertaking to start a new train service in any Member state, both nationally and internationally. However, in application of Directive 2012/34 (as amended by Directive 2016/2370), the Belgian legislator provides that, in the event that an exclusive public service contract has been awarded, the Regulatory Body must carry out in certain cases an analysis of the impact on the economic equilibrium. This procedure is explained below. When a railway undertaking wishes to start a new rail service for passengers, this intention must first be reported to the infrastructure manager and the Regulatory Body (and possibly to supervisory authorities in other countries, should the rail service be provided in different countries). This notification should be done digitally by means of the notification form ‘New passenger service’. Upon receipt of the notification, the Regulatory Body publishes this on its website and informs the following parties: the minister responsible for awarding the public service contract and the railway undertaking executing the public service contract. The parties that have been informed of the new planned passenger service can submit an application for an economic equilibrium test to the Regulatory Body. This request should be done digitally on the basis of the form ‘Application for analysis economic equilibrium’ and must be submitted one month after notification. If no analysis was requested, the Regulatory Body will immediately inform the applicant and the infrastructure manager. The latter then handles the request for access in accordance with the legislation. When an application for research is submitted, the Regulatory Body will examine the net financial impact of the new planned transport service on the public service contract as a whole (and therefore not on individual services or lines). If necessary, the Regulatory Body can request additional information from all parties involved. As a result of the analysis, the Regulatory Body will issue a decision on the basis of which the right of access to the railway infrastructure will be permitted, modified, permitted under certain conditions or refused. A non-confidential version of the decision will be distributed to all parties involved and will be published on the website of the Regulatory Body. Any person who proves his or her interest can lodge an appeal with the Market Court in Brussels, against any decision of the Regulatory Body in the context of its competence to administratively handle disputes, its monitoring mission and its competence to handle complaints. The appeal has to be lodged within one month starting from the notification of the decision or, for the interested persons to whom the decision did not have to be notified, within one month starting from the publication in the Belgian Law Gazette of the decision referred to. The Market Court takes a decision with full jurisdiction. D-2015-10-S regarding the modification of the tariff principle Your Shunts. In this case, the Market Court rejected the appeal submitted by Infrabel. The judgment can be found here (in Dutch only). Regarding the railway sector, the Regulatory Body is active in two European forums. The Regulatory Body is a member of IRG-Rail and also participates in the discussions and exchanges of the European Network of Rail Regulatory Bodies (ENRRB). IRG-Rail unites the independent rail regulators from 31 European countries. The work of this group is mainly divided among six working groups. These working groups serve not only as a platform for the exchange of best practices, but also form an ideal basis for the ever-growing number of tasks that require cooperation between the various European rail regulators. ENRRB is the forum where all European rail regulators come together under the chairmanship of the European Commission. During the meetings, the European supervisory bodies share their experiences and best practices. In addition, the network advises the European Commission in the preparation of implementing measures, such as the various measures that the Commission must take in the context of Directive 2012/34. Since January 1st, 2007, rail freight transport in Belgium has been fully liberalised. In 2010, international passenger transport also followed. With the fourth railway package, which focuses on the opening up of the domestic passenger transport market and the introduction of an allocation procedure for the public service contract, the railway market will be fully liberalised with a few limitations, and this as of January 1st, 2019. This movement of liberalisation aims to create a single European railway area. Although the regulatory monopoly on the Belgian market was abandoned, it can be concluded that there has been little dynamism in recent years. The historical operator remains strongly dominant and there are few big “new entrants”, which points to technical, economic and / or operational obstacles. Via market monitoring, the Regulatory Body follows the developments of the market. This way bottlenecks, threats and / or potential opportunities can be identified and the evolution of competition on the market can be monitored. 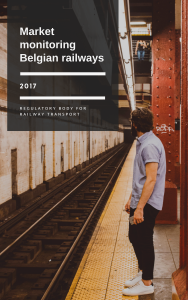 A full market analysis can be found in the 2017 market monitor report for the Belgian railways. In general terms, a distinction can be made between 3 rail markets: domestic passenger transport, international passenger transport and freight transport. This market concentrates around 1 operating model, that of the public service, for which SNCB has an exclusivity. This may change when the domestic passenger transport market is opened up in 2019. From then on, a railway undertaking can start a new railway connection, subject to compliance with certain conditions (economic equilibrium). More about this in ‘Access to the rail network’. This market, on which there is limited competition, has been liberalised since 2010. Some railway undertakings are active here, but with little competition on the same routes. This market is currently characterised by an operating model of ‘high-speed trains’. Recently, the business model of low cost journeys on international train connections has been applied to a very limited extent. Corridor 8: Bremerhaven/Rotterdam/Antwerp – Aken/Berlin – Warschau – Terespol (Polish – Belarusian border)/Kaunas. Corridor 1 extends through the industrial heart of Europe along the Rhine from Rotterdam to Genoa and connects Zeebrugge and Antwerp via Cologne. The corridor came into force on 10 November 2013. Considering the international character of this corridor, the Regulatory Body has concluded a cooperation agreement with the other supervisory authorities concerned for the handling of complaints regarding this Corridor. The cooperation agreement can be found here. The German supervisory authority, the Bundesnetzagentur, is responsible for dealing with complaints regarding decisions of the Corridor One Stop Shop. For complaints which relate only to the Belgian territory, the Regulatory Body is the competent service. The supervisory authorities concerned cooperate closely in the handling of complaints. Corridor 2 connects the most important European harbours (Rotterdam and Antwerp) with the industrial zones of Western Europe and is the access gate to the South of Europe (Swiss, South of France, Spain and Italy). The Corridor officially entered into force on November 10, 2013. Considering the international character of this Corridor, the Regulatory Body has concluded a cooperation agreement with the other supervisory bodies for dealing with complaints regarding this Corridor. The cooperation agreement can be found here. The Luxembourg Regulatory Body ILR is responsible for handling complaints regarding decisions of the Corridor One Stop Shop. The Belgian Regulatory Body is competent for complaints that only concern the Belgian territory. Corridor 8 connects the most important European harbours with the German inland and branches out to various Eastern European destinations. This Corridor has been active since November 2015. DIRECTIVE 2007/58/EC OF THE EUROPEAN PARLIAMENT AND OF THE COUNCIL of 23 October 2007 amending Council Directive 91/440/EEC on the development of the Community’s railways and Directive 2001/14/EC on the allocation of railway infrastructure capacity and the levying of charges for the use of railway infrastructure. DIRECTIVE 2012/34/EU OF THE EUROPEAN PARLIAMENT AND OF THE COUNCIL of 21 November 2012 establishing a single European railway area (recast). Directive (EU) 2016/2370 of the European Parliament and of the Council of 14 December 2016 amending Directive 2012/34/EU as regards the opening of the market for domestic passenger transport services by rail and the governance of the railway infrastructure..
Commission Implementing Regulation (EU) No 869/2014 of 11 August 2014 on new rail passenger services. LAW of 30 August 2013 on the restructuring of the Belgian railways. LAW of 30 August 2013 on the Railway Code. Royal Decree of 6 July 2011 amending the Royal Decree of 9 December 2004 on the allocation of railway infrastructure capacity and the charges for railway infrastructure use. Regulation (EU) No 913/2010 of the European Parliament and of the Council of 22 September 2010 concerning a European rail network for competitive freight. Royal decree of 21 March 2007 on administrative handling of disputes concerning allocation of railway infrastructure capacity. Ministerial decree of 9 December 2004 adapting the rules of calculation, the value of the coefficients and the unit prices for calculating the fees for the infrastructure. Royal decree of 9 December 2004 executing the chapters VIII and IX of the royal decree of 12 March 2003 on the conditions to use the railway infrastructure.